You'll be £10.00 closer to your next £10.00 credit when you purchase Man of War. What's this? The career of Guernsey-born Admiral James Saumarez reads like an early history of the Royal Navy. His first battle was against the American revolutionaries in 1775, but thereafter his main opponents were the French and the Spanish, and the first fighting ship he commanded, the eight-gun galley Spitfire, was involved in forty-seven engagements before being run aground. Rising through the ranks, Saumarez fought on land and at sea, and was involved in actions in the English Channel, being given command of a squadron of ships based at Guernsey. He served on HMS Victory, took part in the Battle of Cape St Vincent, the Blockade of Cadiz, and was with Nelson at the Battle of the Nile. Promoted to Rear Admiral, he led his ships at the battles of Algeciras and the Gut of Gibraltar. Saumarez was then despatched into the Baltic, where he helped thwart Napoleon’s attempt at conquering Russia. So prominent was Saumarez during the late eighteenth and early nineteenth centuries, he was featured in the Hornblower novels and other fictional books, including Master and Commander. Tony Sullivan, however, tells the true story of one of the most remarkable individuals of the great days of sail, in the first biography of Saumarez for more than 170 years. This is a very interesting and informative biography of an important figure in the naval history of the French Revolutionary and Napoleonic Wars. The author has succeeded in portraying James Saumarez as a man and naval officer of his period in this well-written book which has pace. In conclusion this book was well worth the read and is a valuable addition to the library of anyone wanting to gain further insight into and understanding of naval warfare in late 18th and early 19th century. ...the narrative is well balanced, and we get an interesting portrait of a significant British admiral. A fine contribution to the library of naval biography. ★★★★★ This is definitely one of the best biographies I’ve read and I am grateful for the opportunity to learn so much about a man who did so much in the service of his country! There has been no biography of Saumarez in 170 years, making this a welcome account of this great fighting sailor's life. This well-written work is equally well-pleasing and accompanied by a valid bibliography and a consistent body of notes which is certainly enjoyable for reading, printed in a sober and elegant dress and worthy of a very positive judgment. This biography will take its deserved place alongside biographies of Nelson, Collingwood, St. Vincent and Sidney Smith. Having very recently read about the development of the supply system for the Baltic fleet [see Transformation of British Naval Strategy review on this site] I developed an interest in the career of Admiral Saumarez. Quite fortuitously I found Anthony Sullivan's new book on the life of the man himself. The book covers the whole of his life and, as one would expect from the title, gives a lot of information about his naval career. The ships he served on, the ships he commanded, the squadrons and fleets he eventually led, as well as the actions he was in are all there. Saumarez did not fight in the battle of Trafalgar and, to the authors credit, that battle gets only a paragraph in passing. The author has done his research and does not need to pad out the narrative. The book is without illustrations but has a sufficient number of maps and battle plans to support the text. 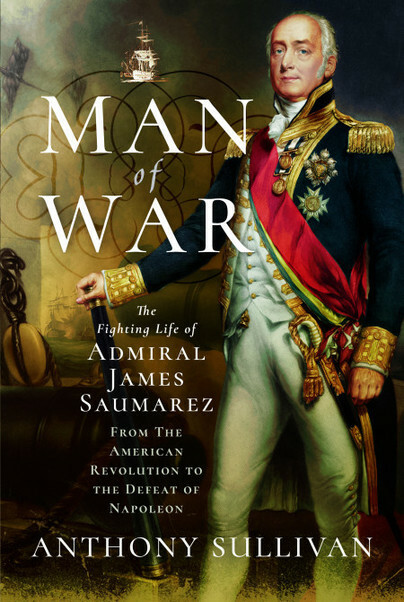 Saumarez was a remarkable fighter, a true naval hero, a family man and a man of his time who was not free of some minor blemishes this I know from reading this excellent book. I have an abiding admiration for Guernsey-born Admiral James Saumarez and in fact dedicate my upcoming book The Baltic Prize (out in November) to this Royal Navy officer. His first battle was against the American revolutionaries in 1775, thereafter his main opponents were the French and the Spanish, and the first fighting ship he commanded, the eight-gun galley Spitfire, was involved in forty-seven engagements before being run aground. Rising through the ranks, Saumarez fought on land and at sea. He was involved in actions in the English Channel, served in HMS Victory, took part in the Battle of Cape St Vincent, the Blockade of Cadiz, and was with Nelson at the Battle of the Nile. Promoted to Rear Admiral, he led his ships at the battles of Algeciras and the Gut of Gibraltar. Saumarez was then despatched into the Baltic, where he was crucial in keeping open Britain’s last vital trade route by an astute combination of diplomacy and a mailed fist. A fascinating biography of a hero by anyone’s estimate of the Great Age of Fighting Sail. Anthony Sullivan was born in London in 1971 but has lived most of his life in Surrey. His grandfather served in the Army, his father in the Royal Navy during the Second World War. He is a graduate of the Open University, where he studied history and is also a member of the Naval Records Society.